When not seen in an aerial view , the reality of the defensive capability of the bastion is not easy to grasp at a single glance. 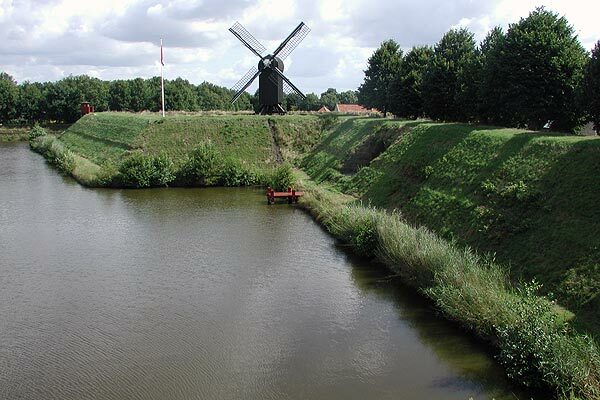 Taken from atop one bastion, this picture shows another bastion at the restored earthen artillery fort of Bourtange in the eastern Netherlands. Planted in the middle of that bastion is an old-fashioned windmill. The bastion seems to be only another angle of the wall, and it appears just as unimposing from ground level. Looks are deceiving. Studying this from one bastion, you can gain an idea of the advantage the defenders had in resisting an attack. The bastion sticks out. Fire from one bastion flank could hit anyone attempting to scale the opposite bastion or the wall in between. The water would slow any rush of men to a thrashing struggle. Should any one bastion be the focus of an assault, you can see it would be easy to continually monitor from an adjacent bastion how well one's fellow defenders were holding up there. If they needed reinforcements, you could quickly determine that and run to their aid sheltered behind the wall's parapet. The bastion system offered flexibility in placing men and material when and where needed, thereby making the most of resources available - and one bastion could support another with its firepower.